Whenever my sister- in-law makes it "home" to Virginia for a visit, I make her a batch of my homemade pumpkin butter. She loves it and I love treating her to it. This year, I am surprising her with not only a batch of pumpkin butter but I am using some of the pumpkin butter to make a batch of my whipped cream cheese Pumpkin Butter spread. This delicious treat is so good on warm bagels, breads and muffins! This 2 ingredient recipe makes a great little gift for neighbors, coworkers, or anyone you just need a little gift for. Tuck in a crock of this creamy pumpkin spread in a basket with some bagels or muffins. They will love it! And... you'll love how easy and quick this gift is! 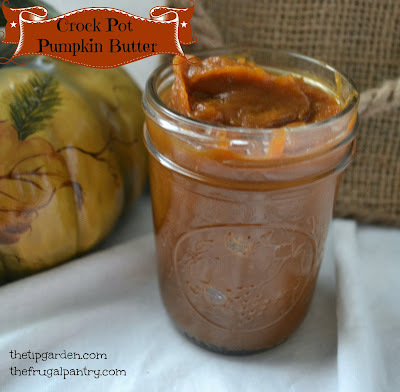 The crock pot does all the work for the pumpkin butter so don't let that stop you from trying this! Jan's Tip: This recipe works wonderful with Apple Butter too! Whip cream cheese and pumpkin butter together in mixer till smooth. The Pumpkin Butter Spread looks wonderful and what a great item to put in gift basket and give away to friends, family and neighbors. I bet this would also be good on graham crackers.